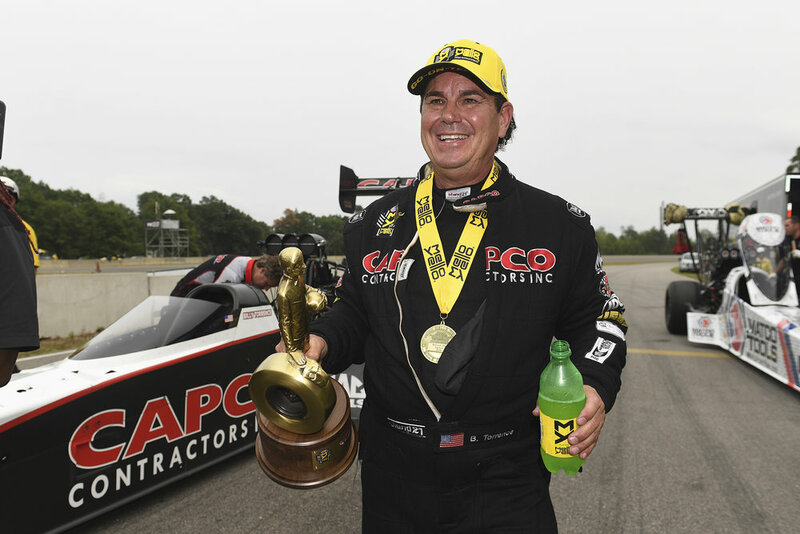 With only one more race remaining before the NHRA Countdown to the Championship begins, there were some teams that certainly made leaps in the right direction during the Lucas Oil NHRA Nationals in Brainerd this weekend. The countdown got one step closer over the weekend, when the NHRA stopped in Brainerd, MN. And we got to see which teams are going to be in and which are fighting for their championship lives when we get to Indy in a week and a half. First off is Pro Stock Motorcycle, where last years World Champion Eddie Krawiec took the victory over his Harley teammate Andrew Hines. In the finals, Eddie got the jump on Andrew and never looked back. Taking the victory with a 6.897 to Andrew’s 6.903. While Andrew still retains the points lead over Eddie, the gap is only 11 points, which is less than a full round of racing. There are at least five other riders that are in contention to move up to the number ten spot in Indy though. Hector Arana is sitting in 10th, but he is only holding on by 10 points over number 11 Jimmy Underdahl and 19 points ahead of Steve Johnson. Based on the math, Indy is going to be a battle for each and every point. This means that qualifying will be even more important than usual for a whole lot of teams. Moving over to the Pro Stockers with doors, we found Deric Kramer and his American Ethanol Camaro in the Winner Circle after he defeated the young phenom Tanner Gray. Tanner had his only real misstep in the finals, as he went double oh two red, and Deric went double oh two green. The ET didn’t matter since Deric had the victory wrapped up before dumping the clutch. Tanner ends up with the runner-up finish, but also leaves set solidly in second place behind Greg Anderson in the points chase. Deric is currently sitting in 6th, and the only place not locked in at this point is 10th, which is being held onto by last year’s World Champion Bo Butner. Bo holds almost a 200-point lead over the 11th place Alex Laughlin. Alex would have to do just about everything imaginable to snag that 10 spot and Bo would have to have the worst weekend of his career. In the Nitro classes, a lot less is settled right now. Let’s look at Funny Car first. This is where we saw the late Terry Chandler backed DSR cars of Tommy Johnson Jr. and Jack Beckman face off for the win in Minnesota. It was Jack’s weekend for victory though. He left first and just continued to pull away from his teammate TJ. Jack lit the boards with a 3.961 to TJ’s 4.031. Both drivers are already locked into the countdown. It is the last three spots that are still not locked in. 8-10 are currently held by 16x World Champion John Force, the Global Electronics car driven by Shawn Langdon, and the LRS Mustang of Tim Wilkerson. It is another Mustang that is fighting to get back in the top ten though. Bob Tasca III is just 24 points behind Wilk for that #10 spot. The SnapOn Tools Toyota of Cruz Pedregon (75 points back) & Jonnie Lindberg (98 points back) are the other two drivers that are going to try and have an epic weekend in their attempt to reach that ten spot. Lastly is the Top Fuel hotrods. The Torrence Family was on it this weekend up north. Not only did Steve make it to the semi-finals, but his daddy Billy went on to win the race with a victory over Antron Brown. Brainerd seemed to be the holeshot capital this weekend and that is exactly what Billy did when his 3.756 beat out Antron Brown’s 3.751. An .037 to Antron’s .045 tree is what made the difference in the final. Antron is already locked into the championship hunt, there are still two other T/F trying to grab that #10 position away from the Scrappers car of Mike Salinas. Richie Crampton and Blake Alexander are the two with a mathematical chance of getting to the ten spot. Billy Torrence is sitting at 13th, but he also runs a limited schedule. While his son Steve is sitting at the #1 spot in the points heading to Indy. Less than 100 points separate the #7 spot from the #11 spot, so watch for some to toss the kitchen sink and others to just make sure they continue to accumulate points and stay in the top ten.